I have always loved caviar, the slight briny flavor of the sea with a unique texture of the eggs, first loose on your tongue, then the burst of flavor as each egg pops open. 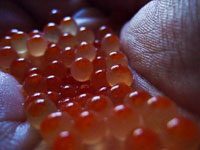 There are not a lot of recipes or techniques that share how fish eggs are transformed into the luxurious caviar. 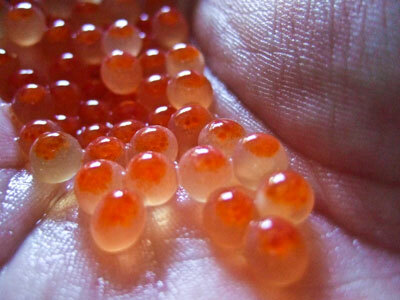 I’m sure you’ve looked this up on the internet and seen how to make fish eggs into bait. This is not what you don’t want to do or eat. 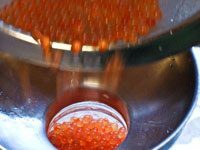 This is a recipe that will become a wonderful base recipe and show you the step by step technique of transforming salmon roe (eggs) into caviar. If you have a friend or family member who fishes for Salmon, ask them if you can have the roe (only in the female salmon). If this isn’t an option, contact your local fishmonger and during Salmon season (in the month of May) and order some. This technique can be used with all types of pacific wild salmon (King [Chinnock], Silver [Coho], Red [Sockeye], Pink [Humpy] or Chum [Dog]). 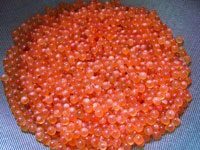 Not that the name would make you think so, but Chum salmon has some of the best roe to make caviar, as their egg sacks or skeins are full flavored and large in size. 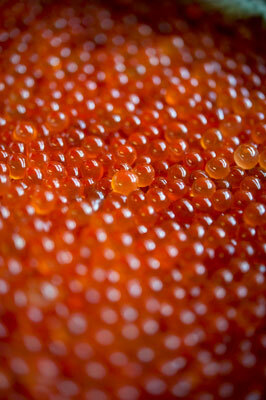 A single skein (egg sake) will weight around a pound and make about 16 ounces of salmon caviar. To get more information on wild Alaskan salmon, please check out our friends at Copper River Salmon. 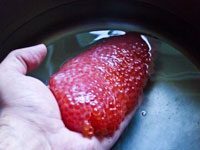 This technique will teach you how to take fresh salmon roe and turn it into amazing salmon caviar. 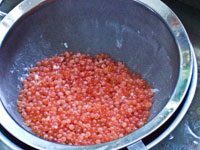 Curing Salmon Roe will become your go to recipe for making homemade caviar. 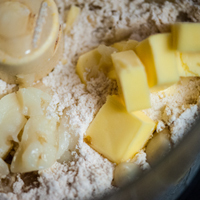 To begin, in a stainless steel or glass bowl large enough to hold 3 ½ quarts; add the kosher salt and 3 quarts of 100°F/38°C degree water, whisking until the salt has dissolved. Next, unwrap the skein or egg sack if bought from a fish market or remove from the fish if you are a fisherman. Rinse the skein under cool running water, cleaning the sack of any residual blood. You will notice a thin membrane that holds the roe in the sack. Add the sack to the brine mixture. 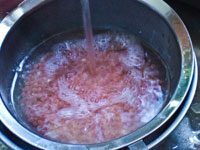 When you add the skein to the salt brine, the membrane and eggs will turn from a clear reddish orange to a cloudy orange color. This is the salt reacting with the membrane. Make sure that the skein is fully covered by the brine. Let this sit for 30 minutes, to cure the eggs. Have a second stainless steel or glass bowl ready with a strainer or small colander. After 30 minutes, remove the skein from the brine, reserving the brine for later. Add the sack to the bowl and rinse off the brine under warm water. Next, the membrane needs to be removed. Using your fingers, pick the membrane and pull away from you, making sure the skein is under the bowl and strainer. Inside the sack are smaller membranes holding the eggs together. These also must be removed. Once all the membranes have been removed from the eggs, the eggs must be rinsed several times, to remove any other membranes that might be on each egg. A fine skimmer or other sieve will make this process. 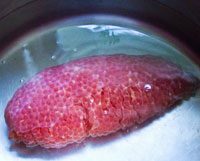 After you have removed all the membranes and rinsed the eggs well, drip the roe into the reserved salt brine again. The color of the eggs will turn from cloudy. to clear. It's like magic. Strain the eggs out of the brine and add to a clean glass jar. This caviar should last for 7-14 days if refrigerated at 34 degrees or below. 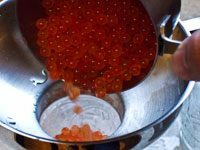 To keep the caviar as long as possible, place the jar into a container of crushed ice, keeping it colder than the standard refrigerator is set too. Do not freeze the caviar or the texture will be ruined. 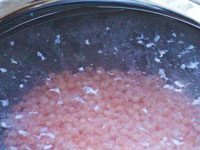 This recipe is simply a basic brine with not a lot of external flavor, other than the dominant essence of the salmon eggs. 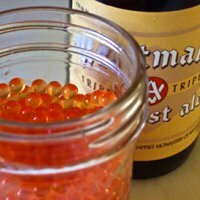 If you would like to add some complexity, try the Westmalle Tripel Cured Salmon Caviar or Firestone Walker Double DBA Cured Salon Caviar recipe. This caviar isn’t as salty as commercial caviars, which I like better. 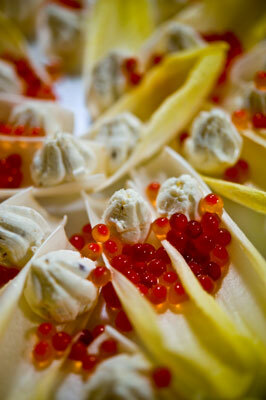 Because of the lack of salt and curing of the roe, this caviar will only last about 2 weeks. JUST MADE SOME, WONDERFULL!, I used eggs from Red Salmon taken from the Kenai river…. 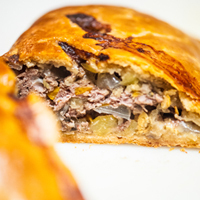 I love the wonderfully texture and light salt taste..
Glad you found my site and recipe! Enjoy! I have found that by chilling the fresh skiens and brining in cold water with or without salt,then using a sive colander to press or rake the skiens over the 1/4-3/8 in colander removes the membranes almost completely. Very little rinsing is required afterwards. I found the perfect colander at Save u More store on kbeach rd. in Soldotna. Ak. It works super with less rinsing. I like to prosses the eggs as fresh as possible. Your skein or egg sack should be fine, as long as there is no freezer burn. 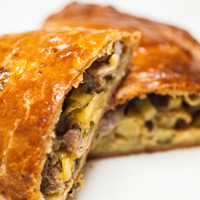 Thaw the egg sack overnight in the refrigerator and follow the recipe as described. Enjoy! Help I cured my eggs but I thought it was 3 cups of water not 3 quarts….did I ruin my roe completely ??? Try remaking the recipe with the correct water amount. 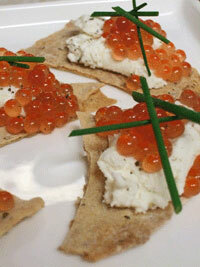 Can anyone tell me if my husband who has had a heart transplant 18 months ago can eat salmon eggs using this recipe? For the amount of caviar that your husband might eat at a sitting, I think it would be fine. This recipe uses less salt than store bought versions. If salt is a huge deal with his diet, I still would recommend talking to his Doctor. How in the world are you getting the eggs put of the sacs? I have tried this recipe at least twice. The sac WILL NOT peel away from the eggs, and if I try to scoop the eggs out with my fingers, half of them get mushed. What am I doing wrong?? Are you seeing the eggs go cloudy? Your brine temperature should be 100F, and holding it at that temperature over time. Please let me know if that works. I noticed you call for a medal or glass bowl for processing. Is there a Reason for using either bowls? What about plastic? Looking for your advice on bowl selection. Additionally, can you explain what iodized salt does to eggs? Thanks for the message Carol. Yes, I suggest harder materials, such as stainless steel or glass for bowls. Plastic bowls can harbor odors and residue that is harder to remove because of the porous nature of the material. Plus plastic is much easier to scratch, causing a ridge that could cut the eggs or harbor bacteria that could spoil the eggs sooner and make them unsafe to eat. And the heat issue, as both metal and glass can be used over heat, plastic can not. These are the reasons why I suggest metal or glass bowls, when making caviar or for other cooking purposes. k in Seattle yesterday, and it was a girl! 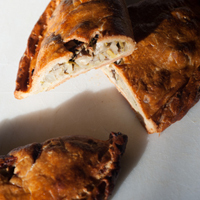 We’ll enjoy it with some bread from Seawolf and lightly herbed homemade cream cheese. Can you do the recipe with Himalayan pink salt? 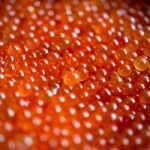 If you have double the amount of salmon eggs do you need to double the amount of water and salt? Thanks for the comment Margaret! 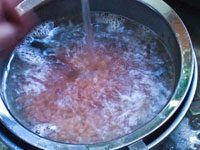 If you are wanting to process all the skeins at the same time, it is best to double the recipe, making a larger amount of brine. You can subsitute Himalayan Pink Salt if you wish. I like using sea salt, as the salmon (and eggs) come from the sea). I just made this and it came out perfect! Gorgeous and the perfect amount of salt. I now have two ice cream pints filled with caviar 😂 Thank you for sharing! I just received a small jar of salmon roe from a friend. I believe it has been refrigerated for 3 days. The membrane was removed, but nothing else done. How long will it keep before I process it according to your directions. It appears to be very fresh, and I’m hoping I will be able to use it. The sooner the better! Smell the eggs, they should smell of the sea, not fishy. I always thought I had my homemade salmon caviar recipe down pat but the last batch of coho caviar I made turned out somewhat dry. The taste was fine but some of the eggs stuck together and didn’t seem to be as oily as they should be. Did i was them too much after brining or did I make some other mistake? Thanks for your comment. It’s hard to be sure without tasting and seeing the results. It could have been the fish, it’s diet and freshness. It also could have been if the recipe wasn’t followed correctly. Hope this helps!